Happy first day of Fall! May the temperatures cool down, the leaves start to turn crimson, and the pumpkins proudly perch on your porches. 'Tis the season for scarves, boots, football, bonfires, and salted caramel mochas. Oh, fall, how I adore you. Since husband and I are in the middle of moving, unpacking, and house projects, decorating for fall has been minimal at best for the time being. If you know me, you know that I'm busting to have all the things fall out already (and have been since July). But, I'm coming to find that in this season of life, patience is not my virtue and it needs to be. My mind is constantly going, making a million to-do lists all categorized into house to-do's, baby to-do's, me to-do's, and so on. This season is full of non-stop go-go-go between our move, husband's job and school work, and a bitty girl who is almost mobile. Amidst what seems to be chaos, I'm forgetting how beautiful this season is, and not just because it's fall. The Lord has been guiding us toward these answered prayers (a home of our own; a baby; an upcoming graduate school graduation) for several years now. We are seeing the fruits of His great faithfulness, and I want to take the time to glorify Him for all He's been moving and doing in our lives. This season, though full and busy, is also one we've been waiting for. And I don't want to forget how much we've longed for it. As I wish the trim would paint itself, the boxes would magically get unpacked, and husband's homework would....well just disappear, I want to remember what is most important. It's not an immaculate and perfectly curated home or fall decorations arranged just so. It's being still and finding rest and contentment in Him. My goal for this fall is to be more intentional in seeing God in my everyday, allowing myself to let my worldly priorities fall to the wayside in order to let His light shine in my life, in my home. It's so fitting that a couple of months ago, as I began chatting with Yuris about a collaboration on a potential project, that I would be drawn to Ecclesiastes 3:1. "To everything there is a season, and a time to every purpose under the heaven." Relevant then and relevant now, the Lord is always revealing Himself in the simplest ways. On a day where I felt abundantly overwhelmed, this verse, so beautifully drawn out by Yuris, stopped me in my tracks. How much I needed a reminder of His ordinance over my life. That in every season I go through His purpose for me has long been standing. He knows where I've been and where I'm going. Beautiful and comforting, right?? 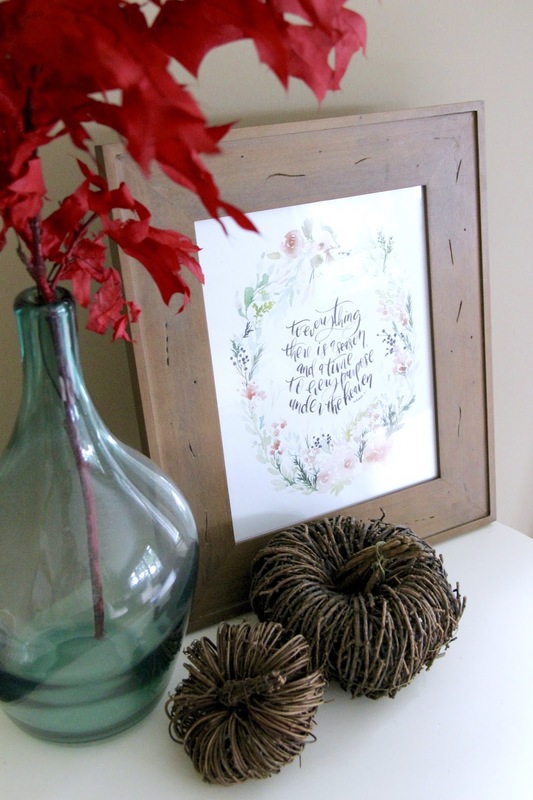 So I couldn't think of a better piece of fall décor than this stunning handmade print to display in my dining room. 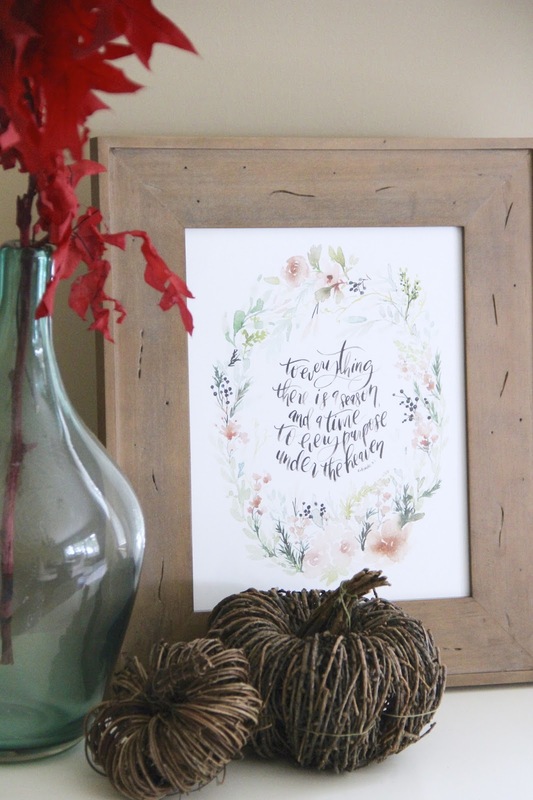 The wispy calligraphy and neutral fall palette couldn't be more beautiful. I'm thankful to have "met" Yuris and had the opportunity for this autumn-inspired watercolor collaboration. If you haven't seen all of her work, you need to peruse through her Etsy shop, Salt Stains, and fall in love. Yuris has been kind enough to give away a digital copy of one of these 8x10 "A Season and a Time" prints. 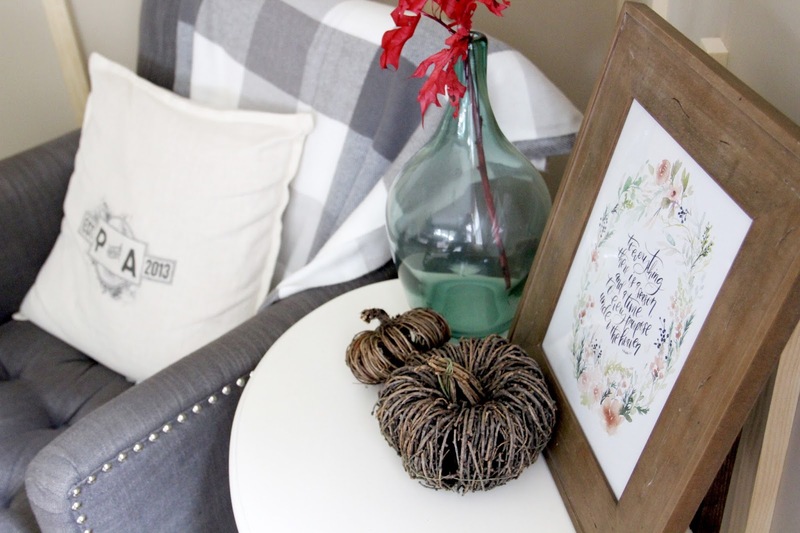 It's a lovely way to add a touch of fall to your home, and of course for whatever season you're in, it's a beautiful reminder that God is sovereign over it all. To enter, head on over to my Instagram!